The Typhoon 1 is a robust hot and cold water pressure washer, designed for heavy industrial use in demanding environments, where electrical power is not always available. The Typhoon range all feature a belt driven pump and alternator. Utilisation of HTD type belts means little maintenance with a long operating life. Comes with a 15 metre (R2T) hose as standard. The Typhoon 2 is the largest in the range, with its ability to be trailer or trolley mounted in a matter of minutes, makes this Typhoon the most versatile cleaning system in Europe. 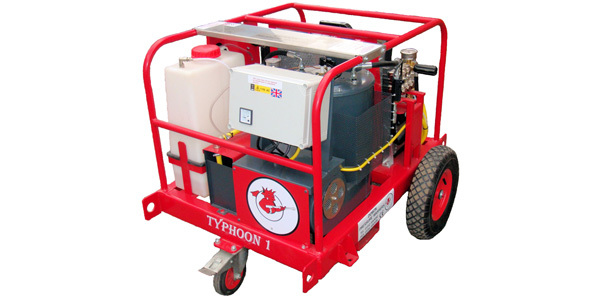 The Typhoon range all feature a belt driven pump and alternator. Utilisation of HTD type belts means little maintenance with a long operating life. Comes with a 15 metre (R2T) hose as standard. *The Typhoon 2 is a custom built machine to customer specification – therefore the sound level will be dependent on the components used. The latest to the green range is the Typhoon LPG – powered by an LPG engine and diesel boiler. 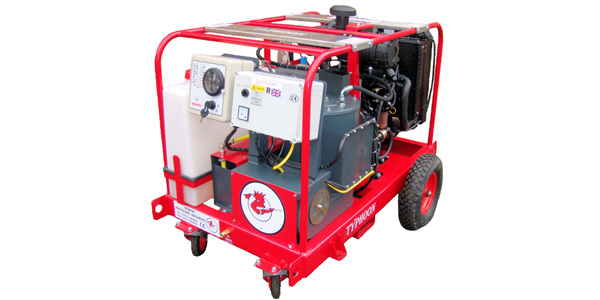 This is a robust hot and cold water pressure washer, designed for heavy industrial use in demanding environments. The Typhoon range all feature a belt driven pump and alternator. Utilisation of HTD type belts means little maintenance with a long operating life. Comes with a 15 metre (R2T) hose as standard.